An exciting thing happened at MongoDB Inc. today. For about fifteen minutes mid-afternoon, a diverse smattering of MongoDBers converged on our cafeteria: sales people, HR, marketing, and engineers stood shoulder to shoulder, chatting and commiserating. I learned one of my coworkers used to work at an amusement park, heard some hilarious stories from the marketing department, and laughed along as we misheard an engineer talking about his DOM (document-object model). Omnomnom. 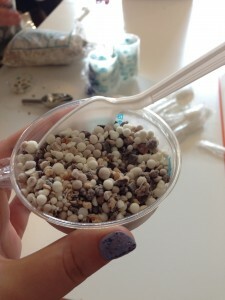 Rocky road Dippin’ Dots. What prompted this convergence? Last week, the lovely person who sits across from me got it into her head that she wanted Dippin’ Dots, so she ordered 35 servings to be delivered (packed with dry ice) to the office. It apparently takes a week, and they arrived mid-afternoon. It seems that all it takes to bring a group of people together is the prospect of unexpected astronaut ice cream. Companies sometimes put a great deal of effort into getting their employees to talk to each other: the all hands meeting phenomenon is probably a good example. On a smaller scale, maybe all it takes to get more people talking to each other is a random treat in the middle of the afternoon, unexpected and unplanned. Bonus points if it’s food you’ve not eaten since you were a kid at an amusement park.